A chef is preparing the food for the next meal for the guests at the Rifflin'Hitch Lodge in Southern Labrador, Canada. Preparing food is something that is done in homes everyday but not nearly as professional as the chef at the Rifflin'Hitch Lodge in Southern Labrador, Canada. This food is presented beautifully everyday to the guests that stay at this fishing lodge in the wilderness of Southern Labrador. 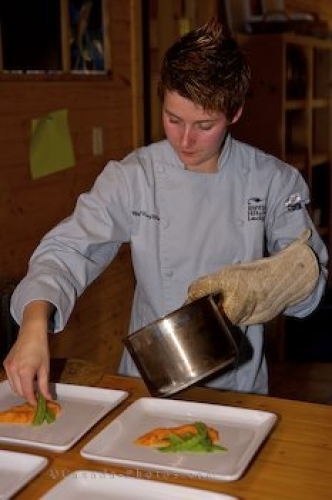 Chef Nancy Elliot preparing a meal at Rifflin'Hitch Lodge, Southern Labrador, Labrador, Newfoundland Labrador, Canada. Model Released. Picture of the chef at the Rifflin'Hitch Lodge in Southern Labrador preparing the food.